Classically funny and brave enough to acknowledge how inappropriate its premise is. ...Bosom Buddies meets a well-adjusted GTO. Now it's up to Hibiki to deal with life as a woman, pay the rent, improve gender relations at the school, and try to prove the principal's hatred of men wrong. 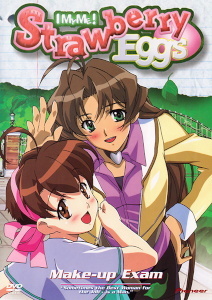 Strawberry Eggs is a solid, well-made anime comedy with just a little twist of creative drama. It's a bit heavy on the fanservice, and for all the gender-bending and reverse misogyny (misandry, if you're wondering), the mores of the story are remarkably traditional, but there's still some cleverness, heart, and even a bit of drama hiding in there. The classic cross-dressing setup leads to a predictable variety of amusing and, on occasion, sexually tense situations. To the series' credit, it (and particularly the young male teacher) does a decent job of keeping its mind out of the gutter, and it eventually builds the tension into some reasonably interesting drama. The characters acknowledge how wrong it is, but the series doesn't take any easy ways out. Also to its credit, there is a fair amount of classic character-building drama, though it's plenty cheesy and a few bits seemed to carry an oddly traditional social message. In any case, there's plenty of funny to go around--lots of "uh-oh" moments and a variety of pervert-hunting. Of particular note, though, is the landlady--she's one of those 3-foot-tall old ladies who kicks some serious keister. From her huge Harley, to a variety of weapons and military hardware, to her slightly perverse sense of humor, she never fails to throw some seriously wacky spice into a scene. The series isn't distinctive visually, but it does look good--bright, crisp colors and art, lots of attractive characters, and nice animation. Nothing at all special, but pleasant to watch. The Japanese voice acting has a wide variety of appealing performances, with the distinctively crotchety and insane-sounding landlady being by far the most memorable. In all, if you're in the mood for a mildly raunchy cross-dressing schoolyard comedy with just a bit of substantive drama, Strawberry Eggs is a solid choice. Don't expect anything particularly original, creative, or tasteful, and you won't be disappointed. Available in North America from Pioneer on four bilingual DVDs. I, My, Me - Strawberry Eggs is Copyright © 2002 YOM - TNK - IMM! Committee. Any images are the property of their respective rightsholders, and included for review purposes only under the fair-use clause of US copyright law.